The concept of loyalty takes on a whole new meaning for Executive Chef Kiko Ojeda, who has been preparing and serving The Palm Las Vegas’ delectable menu items for 13 years. And although he has called the Las Vegas Palm location home for these 13 years, he has actually been with the company for 27. Originally from Mexico, Ojeda was made part of The Palm family when he was only 15 years old, running the professional gamut from dishwasher all the way up to Executive Chef under the owners’ supervision. 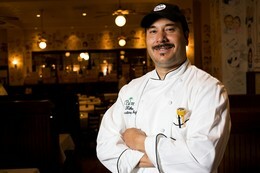 After initially spending some time at a Los Angeles-based Palm, Ojeda came to the Caesars Palace Forum Shops Palm location where he has perfected the Veal Martini dish, amongst many others. That’s loyalty in a nutshell.